• LEAD: As notes to aid you in explaining, illustrating and applying Romans 1–7 as you preach or lead a Bible study. 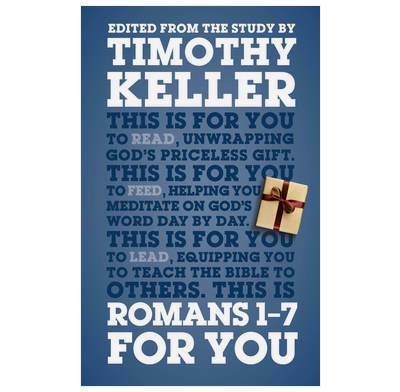 Romans 1-7 for You is designed to work alongside The Gift of God, Timothy Keller's Bible study resource for small groups and individuals. Timothy Keller is a best-selling author and pastor of Redeemer Presbyterian Church in Manhattan. Romans is fantastic a great teaching letter. which was used for the unification of the churches to help spread Christianity through the roman empire and to civilisation as we know it. I've been a Christian a long time, but these books were completely mind blowing. Paul goes through so many basic parts of Christianity that it can be easy to forget. Tim Keller puts it in a really simple explanation, even when dealing with tricky biblical doctrines. A must read for young and old Christians! I found this book very helpful in enhancing my understanding of Romans, especially Keller's analysis of the words expressing the purpose of suffering in chapter 5. That part is so good I plan to memorise it! I have always known that Romans contains the most treasured truths of Scripture - salvation by faith alone, in Christ alone by grace alone - but have often struggled to see this shine out through the complexity of the letter. Until now. Keller unpacks even the most complex verses in the first seven chapters of Romans with a clarity which not only helps with comprehension, but also painfully points out how it is personally relevant. I am already looking forward to the second volume! My breakthrough moment came in Keller's exposition of Chapter 7 whereby the Apostle Paul realises he is 'dead' in his sin because of his inability to keep the commandment "You shall not covet". Keller explains that this commandment tripped him up because it refers to an inward attitude of the heart, rather than an external action. He explains that coveting is an idolatrous longing for more than you have, failing to love God enough to be content, and therefore the essence of sin. This helped me to understand how none of us can keep the law perfectly and save ourselves. We all have idolatrous drives and desires and are indeed dead in our sin.